Texas VSA hosts an annual Culture Showcase which features rich performances by the members composing VSA. 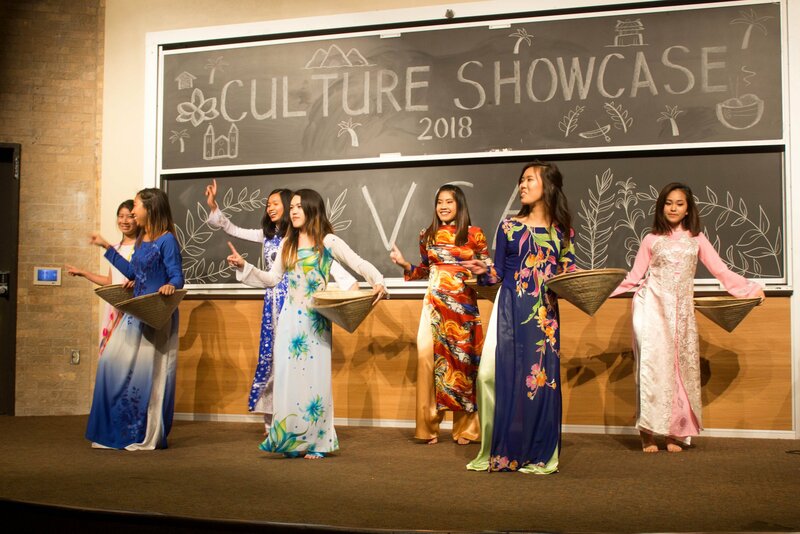 Culture Showcase provides an immersive experience for the students at UT, offering acts such as traditional dancing and singing, instrument playing, and a traditional fashion show starring an assortment of colorful áo dài. A traditional Vietnamese meal, including favorites such as cơm chiên and chả giò, are served after the performances. The 2018 Culture Showcase was held on April 7th and included 47 member performers who contributed to 15 acts total. Three members were chosen to choreograph and teach the modern and traditional dances to their peers during practices which were held for about 4 hours a week per dance. Practices were organized and ran by the members and monitored by officers. Don Bosco, a local Thiếu Nhi Thánh Thể, was invited to the 2018 Culture Showcase as well, performing a traditional fan dance. This performance was choreographed by a members of Texas VSA and reached out to the Austin Vietnamese community. Money was allocated for rental of tech equipment, providing free shirts for all performers and the first 100 audience members, as well as authentic Vietnamese food after the show from a local Vietnamese restaurant. Advertising for Culture Showcase began at the start of the 2018 Spring semester to bring awareness to the event as well as to recruit member performers. This was done during the announcement segment during each general meeting leading up to the event as well as the weekly newsletter. About 1.5 weeks prior to the event, the Texas VSA officers changed their profile pictures and cover photos on Facebook. Each of the sixteen officer’s profile picture was focused on a different aspect on Vietnam culture, such as Tết Trung Thu or lotus flowers, as seen by the hand drawn doodles the subject interacted with in the portrait. A Facebook event page was created that was linked in the description of the profile pictures and cover photos to further promote the event. The 2018 Culture Showcase was put on by the members of Texas VSA for the enjoyment of the entire UT campus. 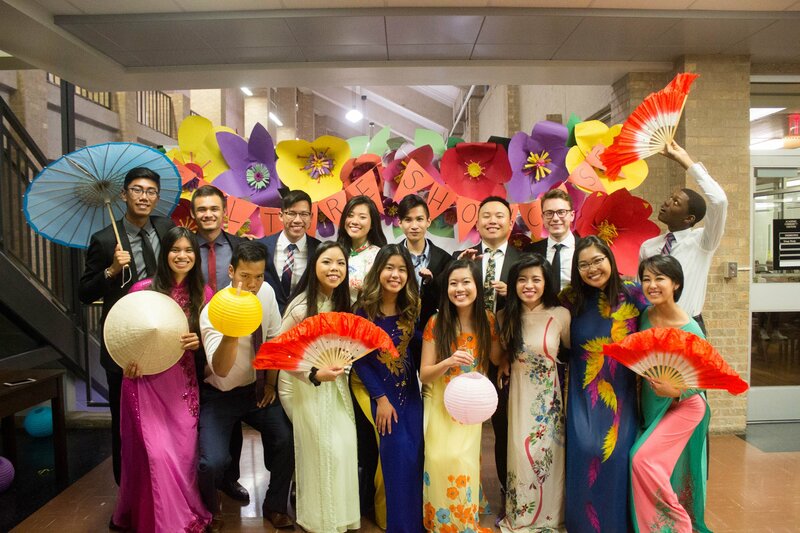 Traditional performances put on by the members of VSA, such as traditional hat and couple dance and singing, was showcased to illustrate the diversity and depth Vietnamese culture has to offer. This gave the performers an opportunity to explore their culture on the big stage. As for the audience, a chance to experience captivating performances put on by their peers that revolve around Vietnamese culture is provided. Support of local Vietnamese businesses in the Austin area was done by providing advertising opportunities in the program pamphlet. The goal of Texas VSA’s annual Culture Showcase is to spread the beautiful culture of Vietnam to the masses through engaging performance. The biggest challenge was securing a location for the event. Due to the large size of the performance, bringing in about 200 audience members excluding the many members and officers that contributed to Culture Showcase, few locations were viable options that can provide a large enough stage and mingling area for the photo backdrop and food distribution. The location commonly used in past Culture Showcase was secured for all dates possible to host the event. Thus, compromise was made, such as renting out tech equipment that would commonly be provided by the original location. This required a learning curve in using the new tech equipment, which included audio and lights. Another challenge is organizing the number of performers. This year, a record number of members volunteered to perform in Showcase. While it is great that many students were so willing to take on the opportunity to embrace Vietnamese culture, this required a greater attention to detail to pull off a successful Culture Showcase as compared to past years.